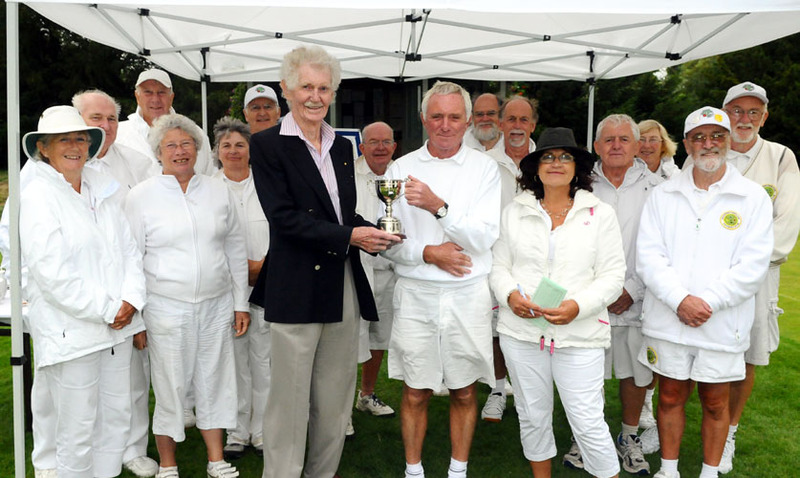 Congratulations to Ryde CC who secured the SCF Golf Croquet Level League with victory over Phyllis Court 'A' today. Mary Gaynor (4) was the toast of the team however in beating the host's Richard Harris, an acomplished '2' handicper in two straight games. Mike Fensome (3) also pulled-off and under-dog victory against Harris but unfortunatly neither Chris Robertts (0) or Helena Fenosme (1) could match these results. ensured the title for the Isle of Wight Club. lovely day out with our friends on the 'small island'. PCC 'C' beat High Wycombe yesterday to sit alongside Blewbury at the top of the SCF Handicap League North. Ther piar drew their match 6 games each earlier in the season and also scored exactly the same number of (net) hoops in that match, and so the calculatore will have to come out to decide precidence. Victory over High Wycombe saw PCC 'B' secure their league 'North title' today. But the champagne will ahve to be kept o ice as there is still the 'play-off' final to come against the winners of the 'South area league to decice the Federation Handicap Champions. Very well done today's team: Mike Fensome, pam Mead, Michael Wiles and John Chalfont (and squad members Raymond Wood and Ian Norris, whio played in earlier matches). 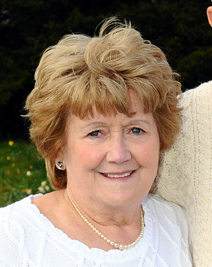 Pam Mead will be the first name to be inscribed on the lovely trophy donated to our Club by Rosie Richardson. Pam finished ahead of 15 other ladies when she defeated Helena Fensome in a very close final that went to the 13th hoop. A couple of missed clearences, so usually taken with ease by Helena, setttled the match and rewarded Pam's consistent play throughout the day. 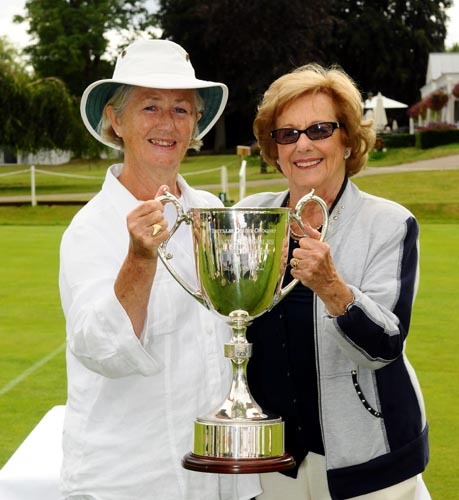 Rosie presented her trophy, which had been in her family for over 50 years, to a delighted Pam at the end of the tournament. Also catching the eye today, was Dianne Brown (handicap 8), who got to within 'the thickness of a hoop wire' of qualifying for the final agaist Helena in her semi-final. Ann Attfield was the other losing semi-fialist and further down the field it was good to see several game success for Joanna Iyer, an underdog victory by Jill Hale and a win in her first tournament for Pat Lane. 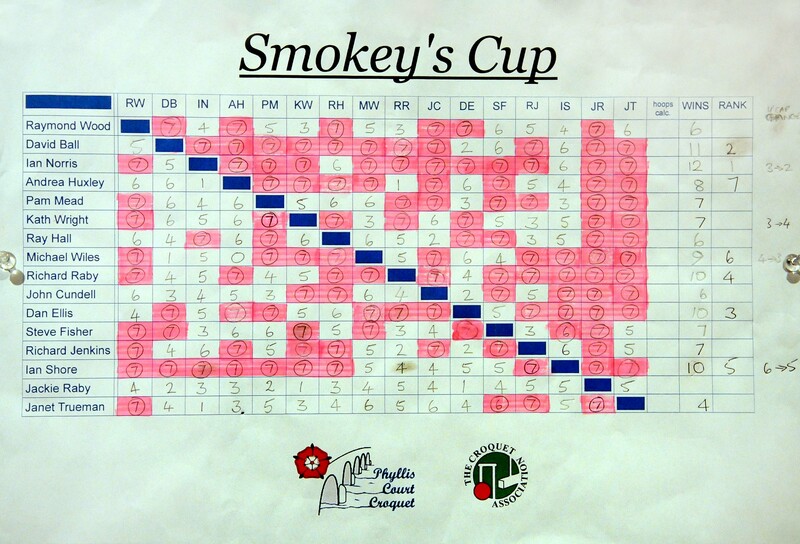 Norris to victory in 'Smokey's Cup at PCC this afternoon. today, put David Ball of Leighton-Linslade in pole position. defending champion Raymond Wood in that crucial last game. thereby allow Norris to win by a clare 'one win' margin. stayed in a Phyllis Court member's hands for another year. with Norris) for the CA's B-Level Series National Final in October. he was joined in similar celebration by Michael Wiles who moved down to '3'. blew rather 'hot and cold' all event. The other 11 players from 8 different Clubs all enjoyed themselves and most vowed to return next season. (For full results, scroll to bottom of this page). 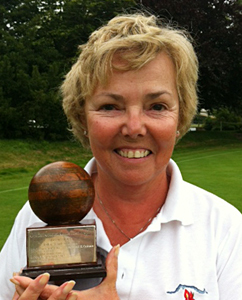 Frances Colman took the lovely One Ball Trophy back to her side board at Luxters farm where it is becomeing a perminant feature. Today she fought of a very sprited chalenge from good a number of the field of 14 and had dig deeper this time round than perhaps ever before. Raghu Iyer impressed in his early games and looked to have Frances on the ropes until a slip let her in to win impressivly from 1 back. Dianne Browne came throught to the final and used her bisques well to keep Frances at bay, only to again be overhauled when close to a finish. Pleaseingly, there was good support from our AC wing this time and they contributed well to this often undersubscribed tournamament that at last seems to have captured some imagination. Norris reaches second National Final! In what is fast becoming Ian Norris' season, he qualified for yet another National Final last week. He had already qualified for the inaugural National B-Level Final by winning the Wrest Park (Bedford) tournament and consolidated this with further tournament wins at Hamptworth (New Forest) and now our own Smokeys' Cup at Phyllis Court. But two days later he is at it again! 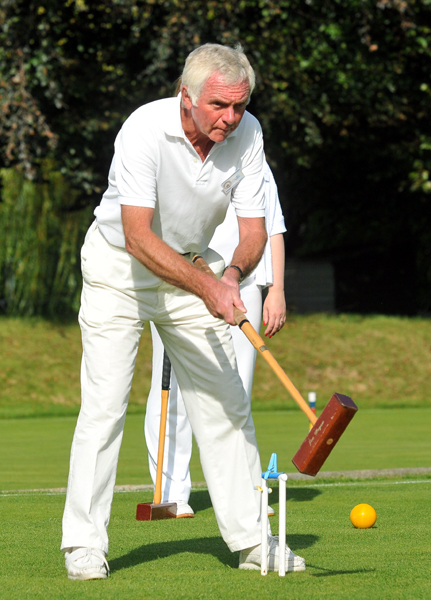 This time he qualified for the National Final of the All England Golf Croquet Handicap competition with a fine second place in the semi-final at Surbiton, playing on the same courts that two day previously had staged the World AC Finals. And boy were those hoops tight! Ian will not be alone at either of these National Finals, as also attending Hunstanton and Hamptworth will be 'the workers' - Frances Colman and Chris Roberts, who are tournament manager and director respectively.